Oh wow! These were already cute but the beads really stepped them up a notch. I LOVE these. And I don't mind posts about previous mani additions at all! I like seeing the change between before/after. I also really like the different hand pose in the second pic! The beads just took it up to the next level -- LOVE IT! I love these. Amazing:) They're one of the many reasons I've nominated you for the Liebster Award:) Pinkies crossed. I often redo my nailpolish day after day so this is completely understandable. 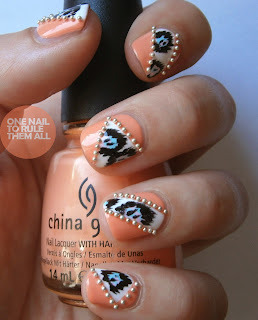 Why not show people hos you can make more out of one mani? People who blog about clothes do it all the time. The "one item - 5 ways to wear it" is common. I actually like this with the studs, but i do prefer the far away look. Think this could be done with dots instead of studs aswell. 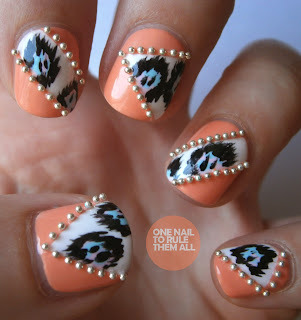 Lovely :) Do you have any tutorial for the ikat nails? LOVE your nails! Def a new follower! !